Before diving into the content of this book, I want to compliment the author and publisher on the format of the book pages. I read about 15 business books every year and most of them have a traditional textbook look and feel. You know what that does to inspired reading – well, this book is not at all like reading a textbook. It’s more on the order of attractively designed help pages with white space and clean font. I know. Normally that aspect doesn’t find its way into a book review, but I was impressed and am giving credit where it’s deserved. This book title is cleverly relevant today. 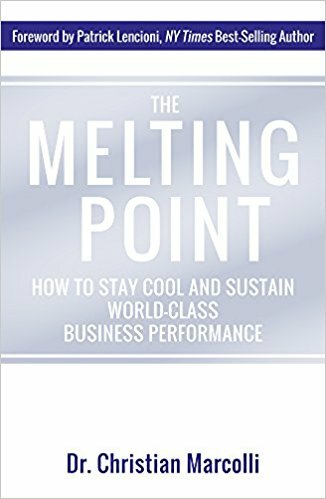 The Melting Point: How to Stay Cool and Sustain World-class Business Performance by Dr. Christian Marcolli, recognizes the volatility of workplaces, teams, groups, and communities today. Dr. Marcolli said, “We have reached the Melting Point when we no longer fully control our thinking, our emotions, and our behaviors, in a positive and impactful way.” The final words of that sentence, at least to me, are the theme of this book. We all reach the point of meltdown but can we somehow transform the potentially negative into a positive and impactful outcome? If you are an emerging leader on the trajectory of rising to your calling, this book is like spending time with a life coach, business mentor, career advisor, and professional counselor. In fact, Dr. Marcolli says, “We need to understand why life has become so tough for business leaders in today’s challenging workplace.” Then he coaches you through it. To grow through these stages, you need to be exposed to challenges and stress. I’m guessing, you will have no trouble identifying with the challenges and stress part. When you read this book, you will be guided through the stages of how you arrive at playfulness where you are responsible for yourself and individuals on your team, and the key operative words here are that you are ‘enjoying it’. To make the trek from ‘Drawn in’ to ‘Playful’ requires that you have an intimate understanding of your Melting Point. When you understand it and the factors interacting to determine your melting point your reaction can go from panic to peace. The author describes how these three factors are interrelated and how they affect your Melting Point. What creates heat for you? Dr. Marcolli gives us 15 examples of what might create heat for each of us, some of which may be relevant to you, but not to someone else. Examples of the fifteen are: Long hours, Office politics, Travel, Executive isolation, Career moves, Family crisis, Health issues, and here’s one for every person reading this – Always “ON”. He also discusses the ten specific behavioral patterns needed to raise your Melting Point. When you read the book, don’t skip the chapters leading up to this one and be sure to read the real-life case studies that are serious eye openers of how executives have learned to raise their Melting Point. I am putting in a plug for the last chapter that walks you through those important ‘10 key behavioral patterns’ to raise your melting point. Dr. Christian Marcolli has written a solid guide that’s transparent and easily understood so you can raise your melting point, not overnight, but through practice and progress.